ALL OF THE INFORMATION YOU NEED RIGHT NOW! What business needs an epoxy flooring system? Any and all. Your floor is the foundation of your business because, without it, you wouldn’t have a business. Sometimes, we forget about the harsh environment our floors are exposed to until we’re paying for an overly priced repair. Commercial epoxy flooring has become one of the hottest trends and for good reason. Due to the fact that the importance of a commercial floor cannot be denied, you should weigh your options for a long lasting and durable floor. Below we have gathered information to answer any possible questions you may have; however, if you find that the information below doesn’t quite answer your questions, then please give us a call. Our commercial epoxy floor contractors are equipped to answer any of your questions. If you have a business, you need an epoxy floor installed by our professional concrete contractors. No other floor compares to the practicality, durability, or cost-effectiveness of a commercial epoxy floor. Epoxy floor coatings are naturally slip-resistant surfaces and with the different textures offer, each floor increases its own safety. 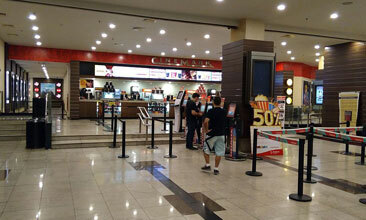 In high foot traffic areas, a non-slip property is extremely beneficial. 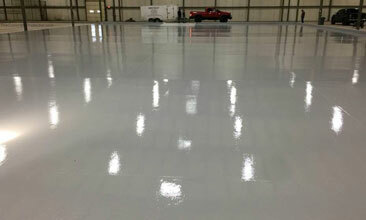 Commercial epoxy floors have a glossy finish to them that brightens up any room or office they’re in. They also come in a variety of colors and tints allowing each area to brighten in a unique way. Adding an epoxy floor brings value into your space and the glossy finish can be a bonus on that value. A commercial epoxy floor coating resists wear and tear that would otherwise occupy your time, allowing you to focus on your business. Once the epoxy has been set, the floor becomes stronger than it was before allowing it to be used more often and still hold up. Chemical, oil, and water spills are all repelled by commercial epoxy floors because the top coating does not allow any penetration into the concretes pores. EVEN THE STRONGEST HAVE SOME ISSUES. Below we have some common issues that people run into with their floors and we recommend taking care of them. 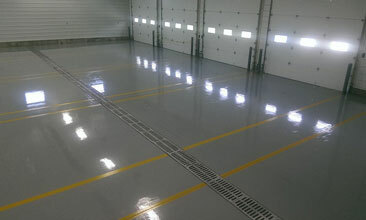 We are the best epoxy contractors in the Grand Rapids area, if you have a question or issue, give us a call. 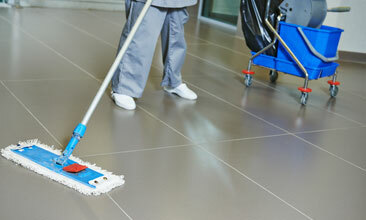 Sweeping daily is not only a safety issue but a way to extend your floors lifespan. Removing any forgotten debris is crucial in helping any hazard objects scratching your floors. Deep scratches can leave your floors funeral against any chemical spills. however, high foot traffic areas or heavy duty areas such as retail stores or garages may require additional attention to ensure the longevity of your floors. Most commercial epoxy flooring is resistant and can hold up against chemical, oil, or water spills, but that doesn’t mean you should ignore these spills. If a section of your floor is not clearing with wiping up a spill, do not wait long because the stain will set making it very difficult to restore that section of your floor. Different floors use different materials, therefore, require different ways of treating the floors. 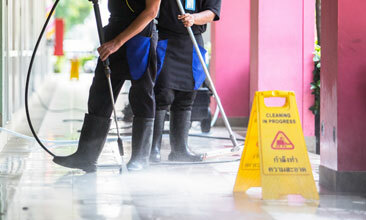 Please, give us a call and speak to one of our professionals about cleaning up your floors. 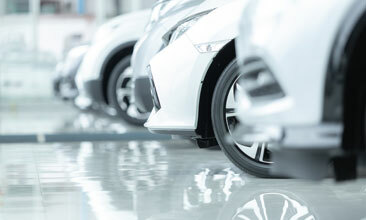 Our team is one you can count on for the best prices around. Are you located in the Grand Rapids area? If so, give us a call, we’re waiting to hear from you. With epoxy contractors from the area, we have more than just professional experience, and we know how to perfect your floor. If you and your business are ready to raise the bar we are here to customize your floors and bring your vision to life. We offer affordable prices for high-end work and unmatched expertise. When you choose us, you choose an expert company that is in the business to bring your vision to life. We love what we do and we want you to love it too.